Glaces de forme de roses fabrication artisinale! Savvy visitors to Paris have probably heard about Berthillon, a family-owned gourmet ice cream shop located on the Île Saint-Louis. Established in 1954, Berthillon has become somewhat of an institution and was voted the best ice cream shop in Paris. 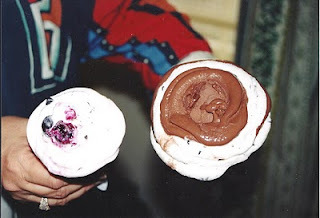 The best ice cream in Paris is not found on the tony island but at Gelati d’Alberto (45, rue Mouffetard) in the lively and bourgeois Latin Quarter. The shop is not as charming as Berthillon, the atmosphere not as posh, but the ice cream is so outrageously delicious that it is easy to overlook the tacky sign and pink neon lights. Made with only the freshest and most natural ingredients, it is scooped using a paddle and shaped into a beautiful rose. I had Belgian Chocolate and Raspberry while my travel companion had French Vanilla and fresh blueberries. If you are fortunate enough to find yourself in Paris, be sure to visit Gelati d’Alberto. It is certain to become one of your Fabulous Finds! What a great recommendation! And the picture makes me want to lick the screen!!! Cela a l'air DELICIEUX! I wish we would have had time to go there together when we were in Paris, next time, c'est certain!